The Harris family have been breeding welsh cobs for over a hundred years, but the Pennal stud was founded in 1958 when William Harris moved from the Rhystyd Stud of Mabwshen to Esgairsaeson on his marriage. The stud is now run by his son David Harris, normally referred to as Dai, who, as this site testifies, is a very dedicated breeder and respected judge of Welsh cobs. 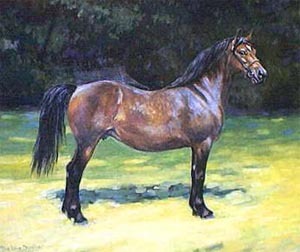 The first Welsh Cob registered by William Harris was in 1965, namely Pennal Princess (by Rhystyd Prince) who was shown in Lampeter Stallion Show as a yearling, where she was second to Parc Rachel. In 1976 William purchased Rhystyd Fashion from his brothers at the Llanarth Sale as a yearling, and she became the foundation for the stud, as well as her daughter, Pennal Lady Model. Rhystyd Fashion (1975 – 1995) was very successful in the showring, both as a filly and mare. In 1978 she was Reserve Female Champion at the Royal Welsh. Fashion was also 2nd in the mare classes at the Royal Welsh Shows in 1979, 1982 & 1983. 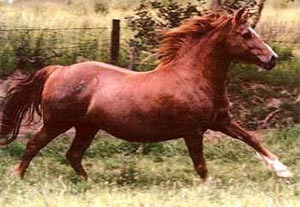 Pennal Lady Model, as mentioned above, was 1st at the Royal Welsh when shown as a foal in 1982. Like her dam before her, she proved to be an important broodmare for the Pennal Stud.